Manga Education Movie: "Is it fair?" As preparation sessions for the SEA Games, JADA’s Anti-Doping Session Slides and Manga Movie were utilized by Anti-Doping Agency Malaysia (ADAMAS). To make the slides more suitable for the event and Malaysian athletes, the contents of the session was slightly modified with permission. 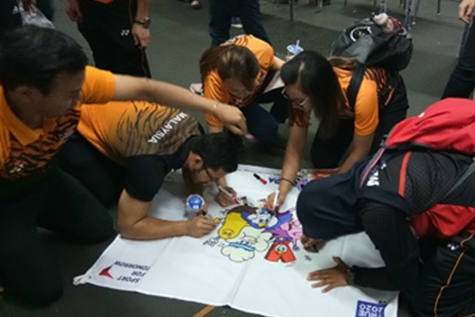 After each session, participants write their signatures on the Flag to Sign as a commitment to clean sport. Manga movies are applicable to youth athletes. They participated well with having fun and share their ideas actively during the sessions. Copyright © JAPAN Anti-Doping Agency | All Rights Reserved.